This year A Toast to Travel is starting a new search, for the most authentic Italian experiences in the Chicagoland culinary world! Vinci is the perfect place to stop for an evening meal. Located on the north side of Chicago the establishment is very inviting. The décor favors the color yellow with golden tones. The aesthetic brings you the feel of the Tuscan countryside without ever leaving the American Midwest. In fact, there is an effort being made to refurbish the interior with a more rustic design. The original tables are being replaced by all wood furniture. My eyes were drawn to the light fixtures, which have been designed to look like twigs that have been twisted into an ornate novelty. The walls are decorated with beautiful murals. As an artist, I was quite drawn to the line drawings of hands near the entrance. It appears to be drawn by charcoal, paying expert attention to line and form, and is quite beautiful. I was greeted by Mr. Richard Russo, the general manager at Vinci, this gentleman has been with the establishment for almost ten years. He states the familiar quality of staff; most stay longer than five years. That says something about the quality this company holds itself to, that even its employees keep coming back for more. In fact, most of Vinci’s business is found in their regular return clients. Vinci has a significant fan base and local following. We were treated to a full menu experience. Richard was most happy to answer any questions and make recommendations for the evening. 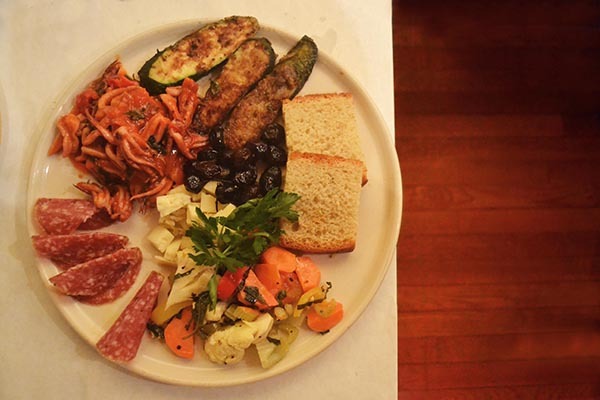 We began with the Antipasti Vinci, which is a sample platter of salame, stewed calamari, zucchini scapece, pecorino cheese, and giardiniera. Richard explained the delicious food on our sample platter as the dish was presented, while we drank delicious pinot grigio. The stewed calamari was excellently prepared, easy to chew, and slightly salty. It was an experience I will never forget. We enjoyed the dining atmosphere. There was a group that sat next to us, regulars at Vinci, who had nothing but praise to share about the restaurant. They were also leaving for their Italy vacations the next day. Vinci, like A Toast to Travel’s wine and culinary experiences in Italy, offers guests a chance to live like a local and enjoy authentic Italian food and wine. A Toast to Travel’s all-inclusive experiences includes the opportunity of cooking in Tuscany as well as exploring the Tuscan countryside. A restaurant like Vinci is designed after our own heart offering their guests a vacation in Italy without going too far from home. The main course, however, was its own trip. We ordered our Secondi, the Chicken Saltimbocca and the Grilled Hen. The Secondi were paired with a deep, full bodied red, Brunello di Montalcino. Perfectly seasoned, the juicy, grilled hen was better than I could have imagined. I am a lover of chicken entrees, and as a picky eater, it can be hard for me to find a dish so mouthwatering. Vinci succeeded. Not to neglect the Chicago Saltimbocca. “Saltimbocca” means to jump in your mouth in Italian and with the generous, delicious prosciutto wrapped all around the chicken, it sure did. We finished dinner with a slice of Tiramisu. The coffee taste was sweet and complementary. 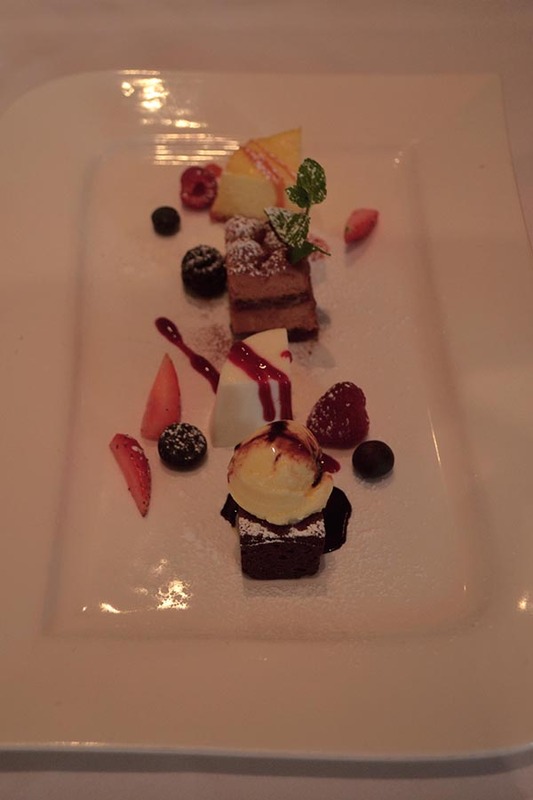 The perfect Tiramisu to end the perfect evening. Our evening with Vinci was excellent. Thank you to Richard Russo for his service and hospitality. Take a tour of Vinci which will feel like Italy tours! There is no doubt in my mind that Vinci is an Authentic Italian Experience in Chicago. When you visit, make sure you take #atoasttothegoodlife. Chef Mauro Mafrici is a tall man, with broad shoulders. 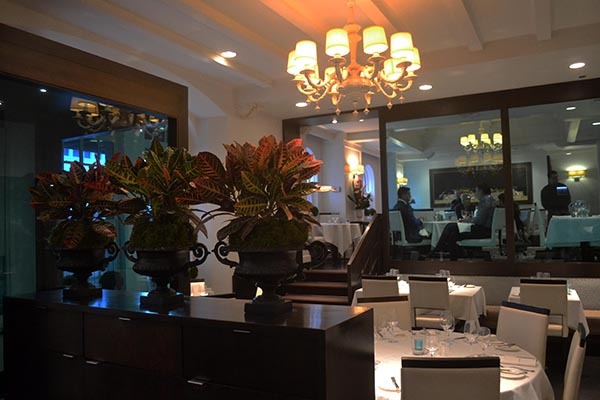 He is jovial and chooses his words with the same care he’s put into the establishment of Pelago Ristorante. 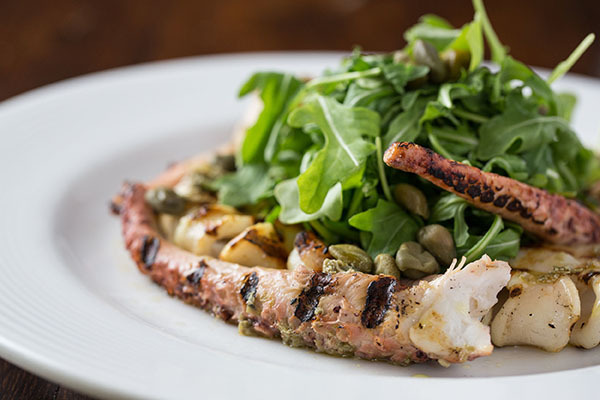 This exclusive gem is tucked away behind the world famous John Hancock Tower, and that’s the way Chef Mauro likes it. In fact, he prefers catering to his guests in this intimate setting. Chef Mauro has been cooking since he was 14, originally from Italy; his 40 years of experiences have taken him a great number of places. It was actually in New York City that he met his lovely wife, Kimberly. She’s the architect in charge of Pelago’s design. There on a sky blue barstool, I sat taking a moment to appreciate the space she’d envisioned. The entire room is a cozy rectangle, accessed through a blue glass bubble entry way. The bar is on the west side and is the first sight one has upon entering. The same blue glass is used to divide the room’s upper and lower levels. The chairs at each table are also blue, and they are accompanied by bright blue purse stools. The stools are a custom adopted from the old wives tale that putting one’s purse on the ground is unlucky financially. The choice in color can be correlated to the Chef’s focus on seafood cuisine. Large windows let a lot of light into the space, and the blue glass partition keeps the room open. This design makes the smaller space feel large and airy. We were treated to a Chef’s tasting. The beginning appetizers were brought, and we sipped Prosecco in pairing. The Burrata is made fresh and is absolutely delicious–the fresh Italian buffalo milk cheese’s delicious flavor seems to explode in one’s mouth, the fresh herbs complimenting it perfectly. It’s one of the best we’ve had outside of Rome and Italy vacations. The Risotto tasting followed. We were tempted with three variations saffron, vegetable and tomato basil. The Saffron was al dente, and tasted fresh from the streets of Italy herself. The Ruffino Chianti red wine paired with the final plater. 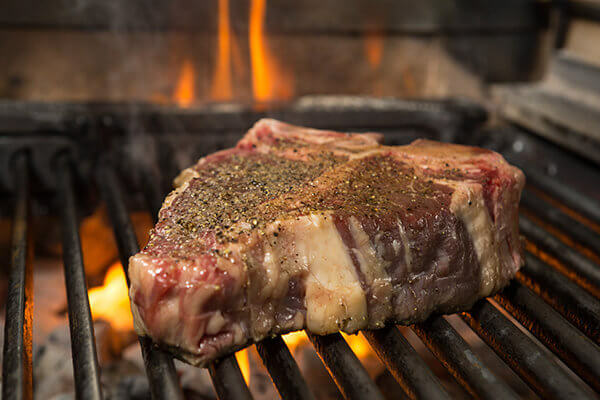 Chianti, Italy is where we, at A Toast to Travel, take our guests for all-inclusive culinary and wine experiences and Italy tours and vacation packages. The afternoon was passed in pleasant conversation, we took our time tasting each dish, and appreciating the ambiance of the restaurant. The room was impeccable. Behind me, on the wall, hung a magnificent oil painting which when looked at straight on may trick you. The optical illusion of depth is created by a black negative space that contrasts the extremely fine attention to detail in the positive foreground. It appears that if one wished, they could simply reach in and pluck the lobster from the display in the painting. The dessert sampling finished our meal leaving us with a very sweet impression of Pelago Ristorante. The service was impeccable and faithfully attentive, which served to create an intimate experience between guest and server, leaving one feeling happy and well cared for. 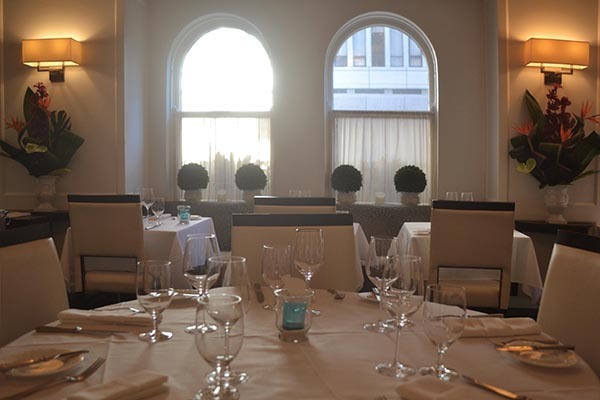 Ultimately, Chef Mauro creates an authentic Italian experience in the heart of Chicago. 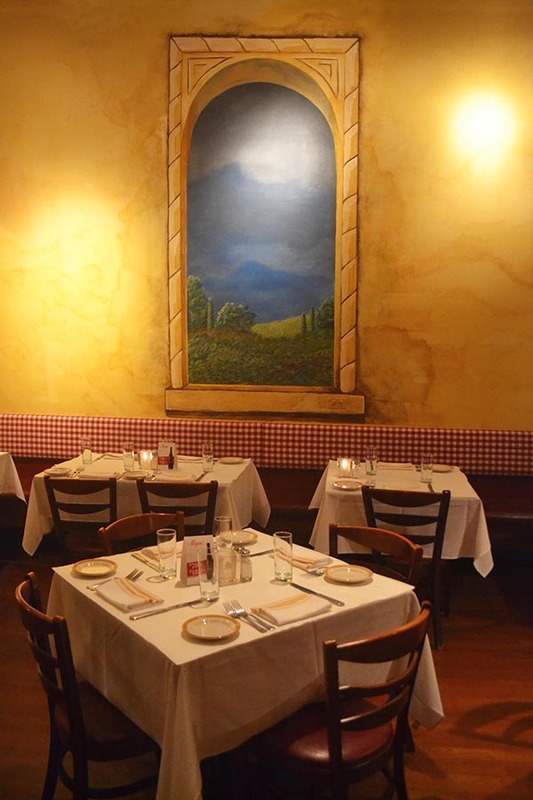 Our first stop is Piccolo Sogno, this little dream of Tony Priolo and Ciro Longbardo, greets you at the door with a first impression you won’t soon forget. I was treated to a first class seat at one of the most tasteful restaurants in Chicago. And don’t just take my word for it, take Italy’s! A placard from Ospitalità Italiana hangs on the left hand side of the main entryway, proudly displayed next to the front desk. I was greeted by a deep blue wall, and I welcomed its immersive calming embrace. Contrasted beautifully by choice of art, the room greets you and so too do the smiling faces of the staff. Abel the manager, was quick to greet me, he had us check our coats with a sweet smiling attendant, from there leading me through the establishment and to the table. After showing me the table, he asked me if I’d like a tour of the rest, including the kitchen. I, of course, was excited to accept; I left my companion for the evening at the table and followed Abel through the main room camera at the ready. I was here for only the best food, so of course I wanted the best photos. 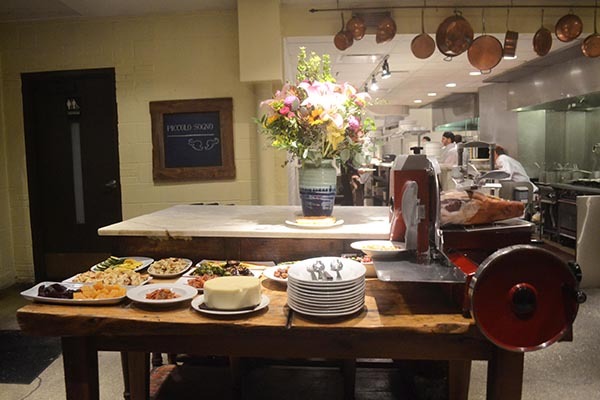 All pasta served and gelato consumed by guests at Piccolo Sogno is made in house. The Antipasti can be found delightfully displayed when you first enter the kitchen; a large red meat slicer sits to the right hand side. All Prosciutto consumed in house is sliced on this machine. Fresh and salty, the Prosciutto is chewy and easy to pull apart, and an excellent way to start your meal if you like ham. Another excellent choice is the Caprese salad, tomatoes and mozzarella served to enchant the taste buds and the meal has only just begun. Another prime feature of the kitchen is its wood burning oven, its gapping maw, fire licking away on the inside tugs on my ancestral heartstrings, the Italian in me appreciates such attention to detail. At the table, I am greeted once more but this time by Italia’s very own bottled stars. The N.V Prosecco, Alexa is bubbly, and gives me that cherished oh so tingly sensation, and yet somehow there is heaviness here among the stars. It’s a full body that can be appreciated and considered very, very smooth. Grissini and Focaccia and Filone are given as choices of bread before dinner at the table, I appreciated the light and airy Filone the best, but my companion liked the Focaccia best. I found it to be a strong flavor, I wasn’t quite prepared for. 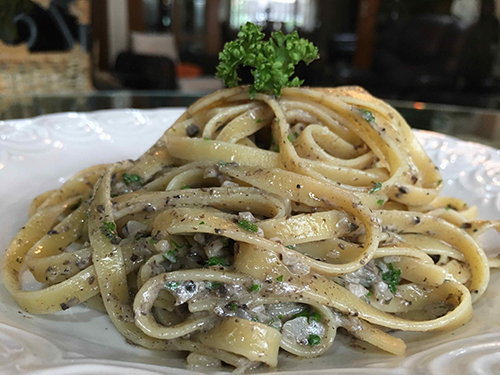 Alberto our servers checks on us often, and takes our dinner order of Tagliolini con Funghi Misti e Tartufo Nero and Ravioli “Piccolo Sogno”. I was promised the perfect pairing of wine with my meal, and Alberto our server for the night has the perfect suggestion. The evening is meant to be enjoyed and I found myself observing the rest of the room. I noticed a few birthdays being celebrated, the birthday candle is lit discretely for the table’s enjoyment. It is personal and private. My ideal birthday treat. The entire setting’s aesthetic can be expressed as intimate. This effect is particularly created by the lighting. It is dark, the room is outlined in a cool white glow but the main source of light is each occupied table’s single white candle. The red wine, a 2011 Chianti Classico, Casaloste, paired perfectly with the Tagliolini! I found myself quite enthralled by the savory flavor of the mushroom and pasta pairing. I can be quite picky, but the flavor of those al dente noodles made even this palate jovial. My companion and I shared meals, and agreed that it surpassed the Ravioli. Now, this Ravioli has won against Bobby Flay, so this is high praise for the Tagliolini! Upon Alberto’s insistence we finished dinner with the Tortino di Gianduja. The first bite of this chocolate delight will send your eyes back into your head. Warm chocolate syrup encased in a light chocolate cake shell sprinkled with powdered sugar. 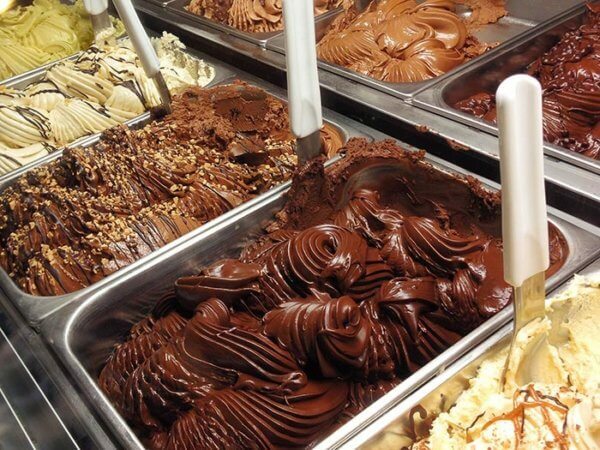 This is accompanied by a single scoop of hazelnut gelato. The pairing is well chosen. 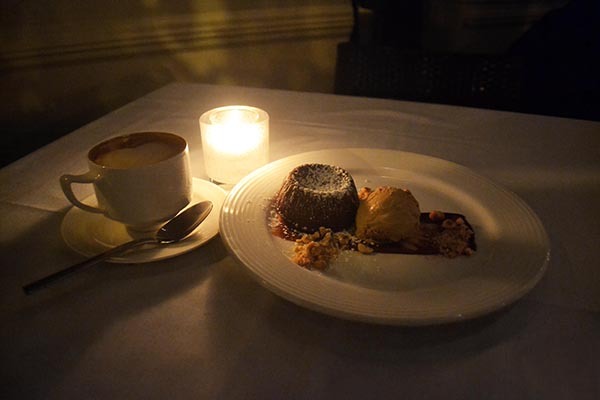 We take coffee with dessert. 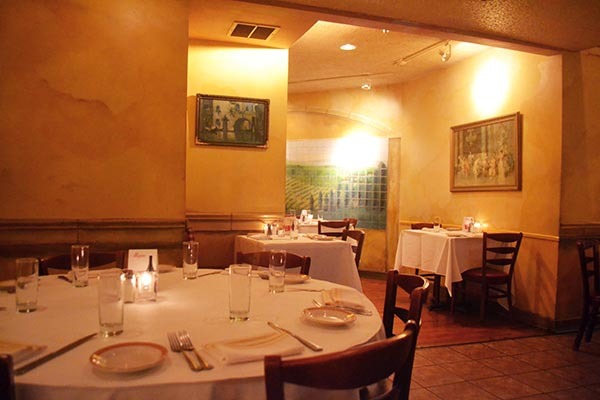 I’d like to thank Piccolo Sogno for an excellent evening. The service is friendly, and the food is tasteful, the experience is authentic. 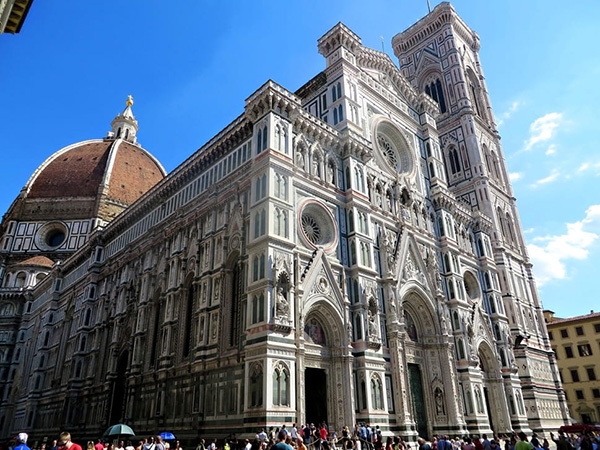 This massive Gothic cathedral simply known as the Duomo, serves the role of not only being Florence’s religious center but is also one of the most recognizable entities in the city. If the viewer is not already enticed from a far by the building’s stunning architecture, once inside the guest will be drawn into a narrative packed with history and culture. Located along the banks of the Arno River in the Historic Centre of Florence lies Europe’s first modern museum. This is one of Florence’s most popular attractions so a long wait can be expected, but if you have the time endure the wait you would be rewarded with the best collection of Italian paintings in the world. When you join A Toast to Travel’s Highlights of Florence and Tuscany Experience, we work with locals who help minimize our wait with advance reservations. 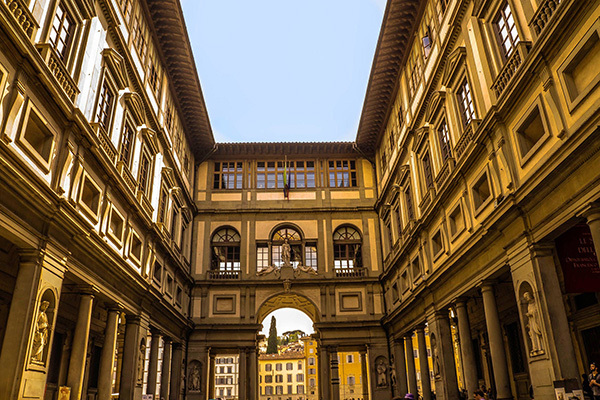 Whether you are observing the work of Giorgio Vasari or admiring the life-sized paintings of Botticelli, the Uffizi Gallery is sure to possess a masterpiece that catches your eye. While this museum holds many works of art that deserve your undivided attention such as St. Matthew or Cassone Adimari, the main reason why this location is one of the most desirable areas to visit by guests can be summed up with one word: David. Michelangelo’s most famous work is housed here in the Galleria and will continue to attract visitors from all over the world for years to come. 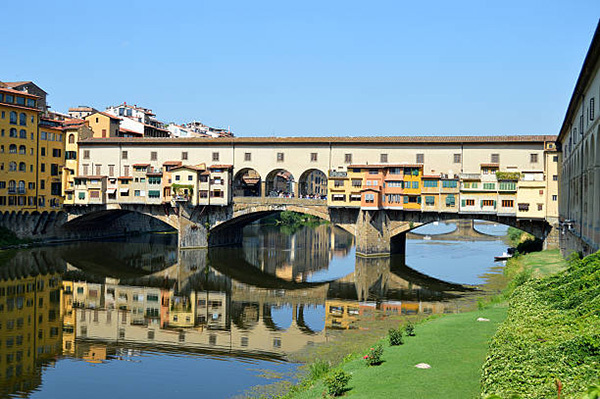 Once a location run by butchers and bakers, a flood washed away the old bridge and, in its place, rose the Ponte Vecchio, one of the oldest bridges in all of Italy. If you are looking for a historically significant area, look no further than the bridge that has survived it all from natural disasters to attacks during World War II. The bridge is known to be the heart of the city’s gold and jewel trade, so expect to find some fancy trinkets as you venture through the markets. During the city walk on the Highlights of Florence and Tuscany Experience, you’ll have a chance to personally experience all the energy of the Ponte Vecchio. If you are looking for a change of pace from the up-beat tempo of Florence’s city center, try taking a casual stroll through the Boboli Gardens. This beautifully landscaped area provides a quiet setting where you can take in all of what Florence has to offer without being bothered by all the noise and commotion of city activities. 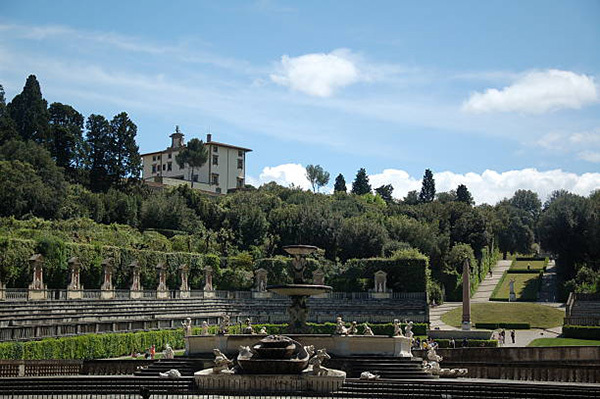 While perusing through the garden try finding some of the statues that have been strategically placed on the path and take advantage of the picturesque views provided by the Boboli family’s garden. Perched high above the city in the Oltrano district lies the Piazzale Michelangelo, arguably the best viewpoint in all of the city. This view comes with a cost, as many of its visitors recall the towering staircase that needs to be climbed in order to reach the square, however, if you are into panoramic views that are sure to garner tons of likes on your Instagram, then it is well worth the workout. During A Toast to Travel’s Highlights of Florence and Tuscany, the brave can join us on the adventure to Piazzale Michelangelo! Most known for its massive doors whose work was once praised by the great Michelangelo, Baptistry also has the distinction of being the oldest building in all of Florence, dating back to the 5th century. Interesting enough, this octagonal masterpiece was thought to be a temple dedicated to the Roman God of war, Mars, but it is yet to be proven. Known also as Giotto’s Bell Tower, the 277-foot tower serves as another vista to capture those scenic views of the city you have been yearning for. The tower actually had three architects influence its construction, so it is very intriguing to see how those powerful minds clashed to create this visual work of art. What were once residential homes for citizens during the Renaissance, is now the location of some of Florence’s most intricate museums after the area was bought by the Medici family in 1549. The Palazzo Pitti is the largest museum complex in Florence, spanning about 32,000 square meters and previous guests suggest blocking out several hours of your day so that you may see all of what it has to offer. This free, outdoor museum area is regarded as the perfect place for the weary traveler to rest as well as viewing some marvelous sculptures, such as the gigantic statue of David replica. This area is great to catch your breath while also not feeling as though you are wasting precious exploration time while you complete your experience in Italy! Florence, Italy is by far one of the most magical and beautiful cities in the world and millions and millions of visitors agree. It’s the birthplace of the Renaissance and home to unforgettable landmarks, museums, monuments, art, culture and food! 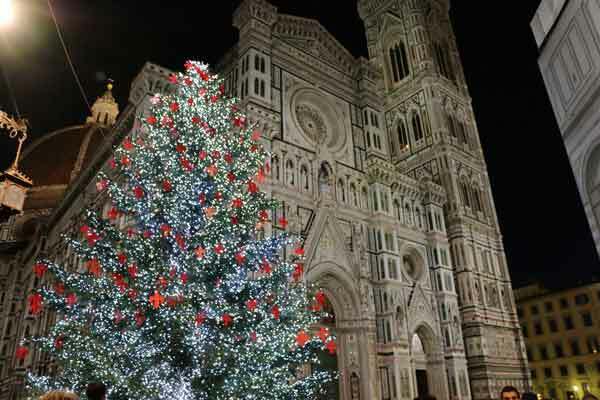 If you have never visited Florence or have been many times, the Christmas season is not to be missed. The streets are festively decorated and shopkeepers take pride in their window dressings. Christmas markets are abound full of unique and precious gifts to buy for you or loved ones and chestnuts are roasting on an open fire but this time—they are everywhere! Living like a local in Florence means experiencing all that it has to offer this time of the year. There are fewer tourists (although there are always people visiting Florence), the weather is milder and there are many cultural activities to take part in. The festivities start in early December. If you are looking for furnishings, food and wine, the festivities for you start at the Christmas markets all around Florence. The largest one is located in Piazza Santa Croce. There’s a combination of vendors and somewhat of a German theme—you know that means–warm wine! Of course, you can always find the leather goods Florence is famous for—bags, gloves, book binders, notebooks, etc. You can also negotiate your prices with better success given the fact that Florence has fewer tourists this time of the year. If you are interested in visiting museums, the Uffizi Gallery is open throughout the Christmas season except on Christmas and New Year’s day. If instead you are looking for a spiritual experience, Christmas Eve Mass is held by the Cardinal of Florence at midnight in the Duomo of Florence, while the vigil prayers start earlier, around 11 pm. For New Year’s Eve, you can celebrate in the main squares of the city and attend one of the concerts. In the Piazza della Signoria, for example, there’s usually a classical music concert while in the Piazzale Michelangelo, a pop concert on New Year’s Eve. 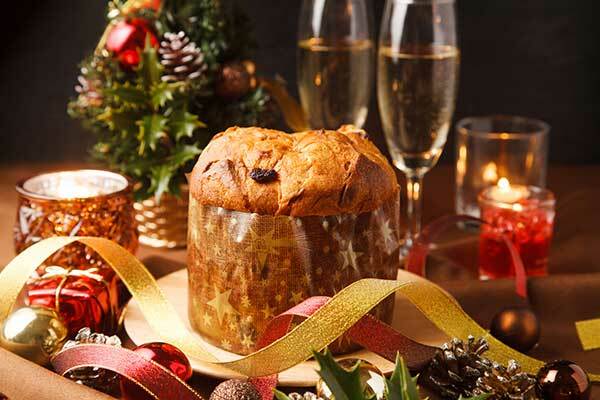 Living like a local, there’s plenty to see and do during the holidays in Florence. Some wineries are open and other well-known cities such as Siena and Arezzo also have festive decorations and holiday markets. These make for very enjoyable day trips. We look forward to hosting you during one of our experiences where you will learn to live like a local all seasons! 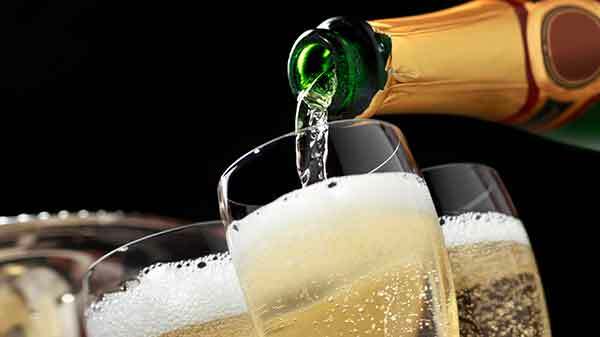 Happy holidays from A Toast to Travel! 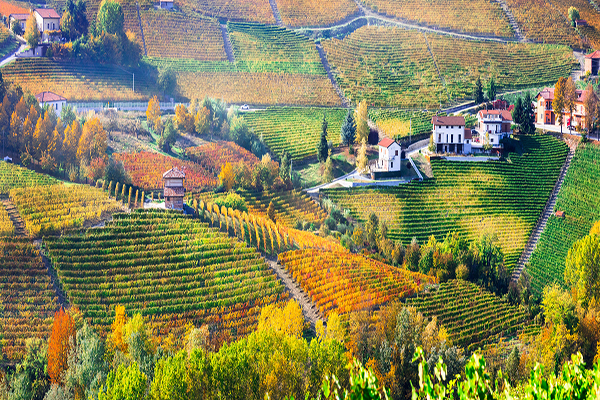 There are very few places that can compete with the beauty of Tuscany in the fall. The leaves are turning colors, the air is crisp, the temperature mild and if you love wine, now is the time to travel. La Vendemmia is the harvest of the grapes and each year, many take advantage of this time of the year to travel to Tuscany. 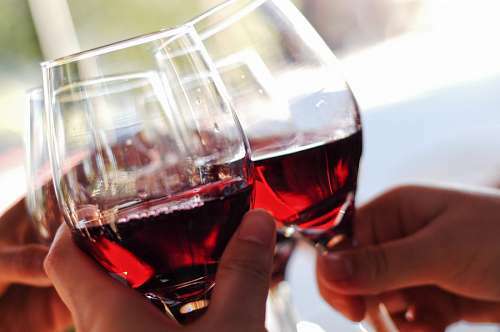 Italy is dependent on wine production for its economy and it’s an important time of the year. Unique grape harvesting activities abound in Tuscany while grape stomping like you may have seen in I Love Lucy is considered unhygienic. Fun, but unhygienic. Fret not, there are many activities you can take part in or if you are like us, you can just enjoy drinking it. For those of us who enjoying drinking it, grape selection is an important part where the ripeness of the grape matters. There are many different tasks that must be completed during the grape harvest, and although no one can exactly predict the week the grape harvest will happen, it’s still a beautiful time of the year in Tuscany. During The Ultimate Tuscan Wine Experience, we host you on visits to 4 different and stunning wineries in Chianti where you can live like a local and take part in the revelry—even if we don’t stomp grapes, we still enjoy all the abundant wine Tuscany has to offer with Chianti being the most well-known. The harvest is not only for wine lovers. 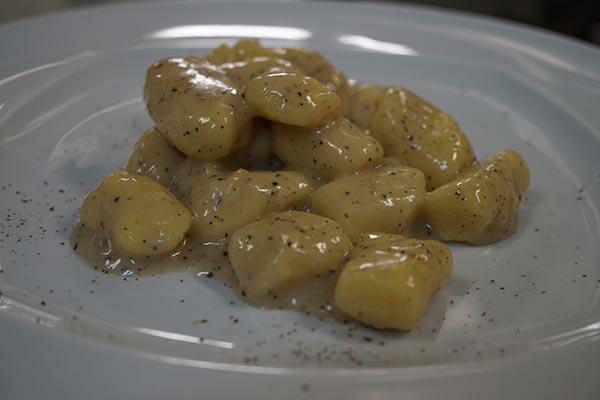 Many fall foods are abundant in Tuscany and ready for you to enjoy from fall root vegetables to chestnuts to mushrooms. 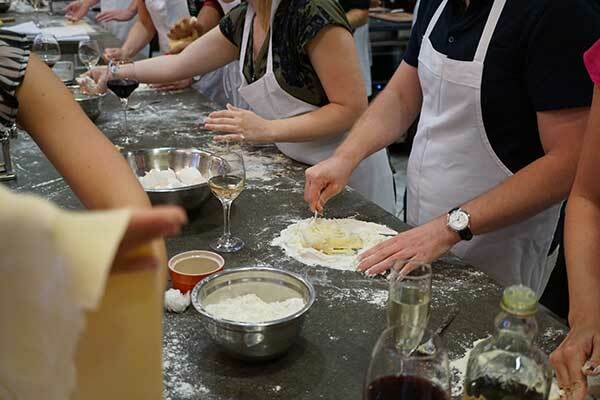 During our Cooking Under the Tuscan Sun Experience, we take advantage of the fall abundance during our hands-on cooking classes. 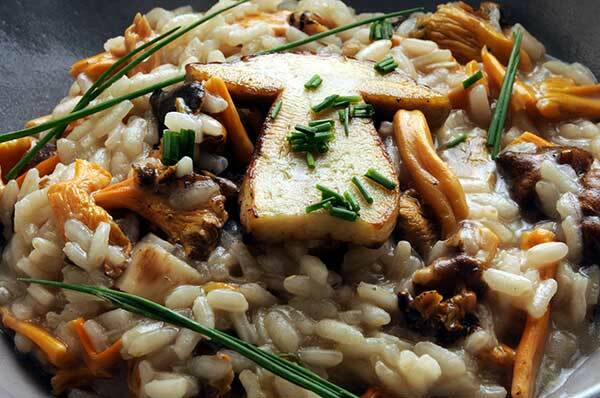 Simone, our resident chef, will show us how to make an authentic and mouth-watering mushroom risotto using farm to table mushrooms and herbs. 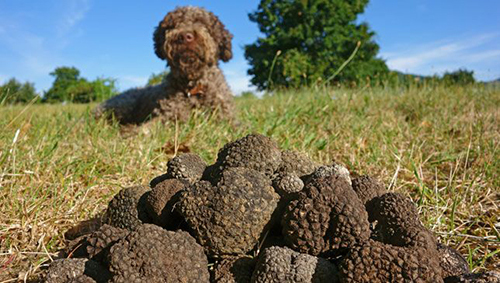 It’s also time to hunt truffles for the other delicious dishes we will learn to make all as part of living like a local. 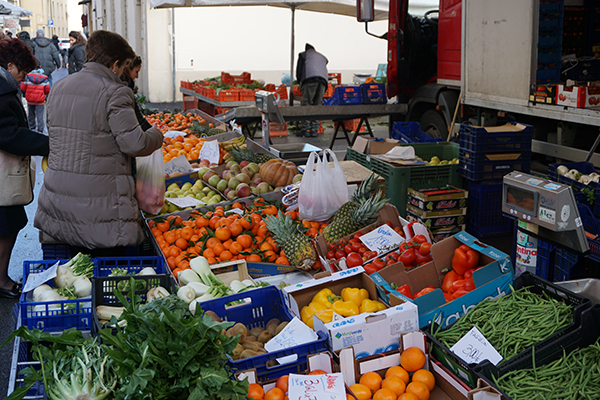 The markets are full of fresh fruit, vegetables, herbs, nuts, cheeses, salumi, bread and more! It’s an embarrassment of riches and a way of life at the same time. The prices are reasonable, goods are seasonal and it’s the perfect time and place to sample the local cuisine. As you walk through the beautiful market and take in all the scents, sights and people, notice how relaxing the experience can be. It’s what living like a local is all about. 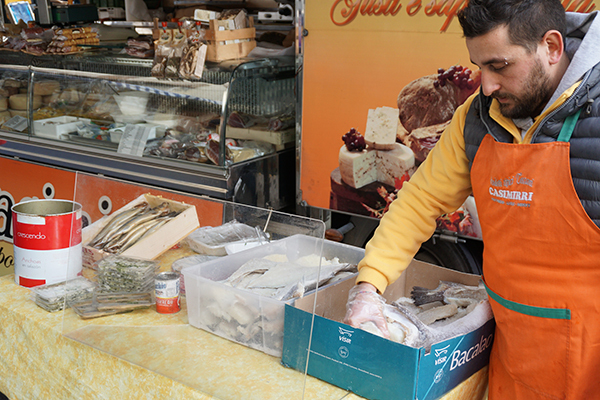 For an authentic Tuscan experience, visiting a local market is essential. You can soak up the culture and rub shoulders with the locals. Watch the many different colorful personalities selling their goods—the local farmers, cheese-makers and artisans come to sell their goods every day. While at the local market, you usually can enjoy other culinary delights like fresh pasta, desserts and even, sample some wine . I personally use the farmers market not only to buy fresh produce and cheeses but also to socialize with friends and acquaintances. It can be an adventure, a time for socializing and practicing or keeping up your Italian language skills. You can also get the latest on all your questions from the locals—ranging from recipes and the best produce to buy right now to politics and elections around Italy and more. Everyone has an opinion! 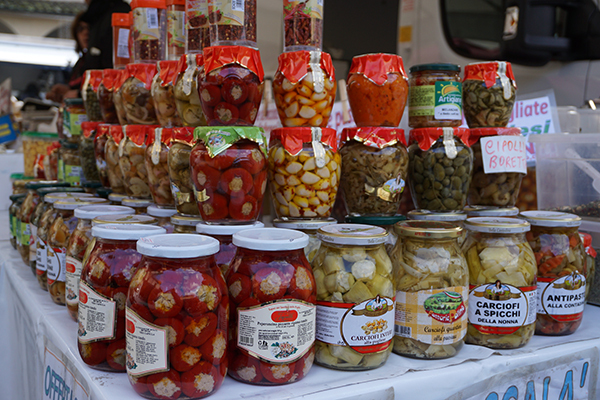 Italian food markets are weekly, bi-weekly or even daily. It depends on where you are located. Most Italians frequent the food markets regularly as a means of buying their fresh fruit and vegetables, cheeses, breads and even desserts. Much of the shopping is done before lunch so that the food purchased at the market can be incorporated into the lunch menu and is supremely fresh. For me, visiting a local Italian food market is much more than just buying fresh tomatoes, burrata and basil even though I usually make a caprese salad right after my visit! 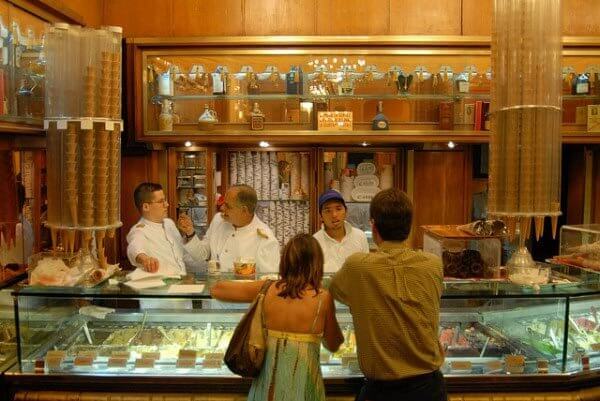 It’s an essential part of Italian life, shopping with the locals, seeing old friends and making new ones, maybe stopping for a coffee after and generally catching up on life. It’s a feeling of connectedness that is hard to find in a US grocery store with lists in our hands and little time for enjoying the moment. I always leave the market with a fresh perspective and a smile on my face. I look forward to experiencing a local food market each time I am in Italy. It reminds me of what’s important in life. 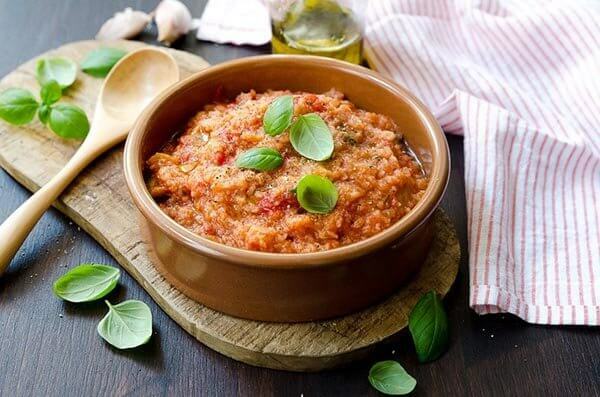 We invite you to join us on our Cooking Under the Tuscan Sun Experience so you can experience Italian food markets, an essential part of local life!